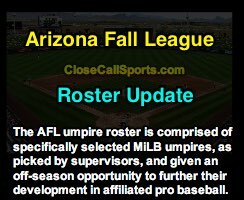 Specifically selected by supervisors to further their development in affiliated professional baseball, the following Minor League umpires will officiate the Arizona Fall League as selected from Triple-A's International (IL) and Pacific Coast League (PCL) umpiring staffs. Previous AFL experience (if applicable) and MLB call-up information is also listed. > John Bacon. IL. 2017 Spring. 2018 MiLB Postseason. > Bryan Fields. PCL. 2017 AFL. > Dan Merzel. IL. 2017 Spring Training. 2018 MiLB Postseason. > Jeremy Riggs. IL. 2018 MiLB Postseason. > Alex Tosi. IL. 2017 Spring Training. 2017 AFL. 2018 MiLB Postseason. > Junior Valentine. PCL. 2017 Spring Training. *Roster breakdown: 3 Pacific Coast League + 10 International League = 13 AFL Umpires.